Laparoscopic liver resection has been reported as a safe and effective approach for the management of hepatocellular carcinoma (HCC). However, its perioperative and oncological outcomes have not been evaluated in left hepatectomy patients. The aim of the present study is to compare the outcomes of left hepatectomy through laparoscopic and open approaches in left HCC. From December 2012 to October 2016, laparoscopic left hepatectomy (LLH) was performed in 40 patients and open left hepatectomy (OLH) was performed in 80 patients. All clinical data were analyzed retrospectively. Propensity score matching of patients in a 1:1 ratio was conducted based on tumor size and presence of microvascular invasion. Tumor size and presence of microvascular invasion were higher in the OLH group than the LLH group (P < 0.05). However, the operative time was longer in the LLH group than in the OLH group (266 min vs. 239 min; P = 0.005). The median postoperative hospital stay was significantly shorter in the LLH group than in the OLH group before and after matching (9 days vs. 13 days; P < 0.001). The incidence of complications in the LLH and OLH groups was 10.0 and 7.5%, respectively. The disease-free survival (DFS) and overall survival (OS) in the LLH group were not different from those in the OLH group after propensity score matching. A laparoscopic approach is feasible and safe for left HCC. The oncologic outcome of LLH is comparable to that of OLH. Laparoscopic liver surgery requires additional advanced skills over open surgery. Since the first laparoscopic liver resection in the 1990s, there has been continuous improvement in laparoscopic techniques and devices, and accumulating data have allowed the development of laparoscopic liver resection of hepatocellular carcinoma (HCC) in cirrhotic patients [1–3]. Despite the technical difficulties, the number of publications on laparoscopic liver resection has been increasing . However, many of the studies involve small numbers of patients; thus, evidence supporting its full development is still insufficient. Recent studies have confirmed that laparoscopic HCC resection and laparoscopic donor hepatectomy are safe and seem to improve the postoperative course [5–7]. Significant advantages of laparoscopic wedge resection or left lateral sectionectomy versus open procedures have been widely reported [4, 8, 9]. However, laparoscopic major liver resections have been limited to a few institutions due to the technical demands of the procedure [7, 10–12]. Although a recent study reported that the outcomes of purely laparoscopic right hepatectomy in HCC patients were comparable to those of open right hepatectomy , left major hepatectomy has been limited to a few medical centers because of its technical complexity . In addition, left hepatectomy is a less commonly performed surgical procedure compared with right hepatectomy. No report has described the feasibility of pure laparoscopic left hepatectomy in a large cohort of HCC patients. Previous published studies reported that the oncological outcomes of laparoscopic hepatectomy were comparable to those of open hepatectomy [1, 3, 13]. However, there is insufficient evidence to determine whether laparoscopy is more suitable than an open procedure for the treatment of HCC because of different tumor locations. 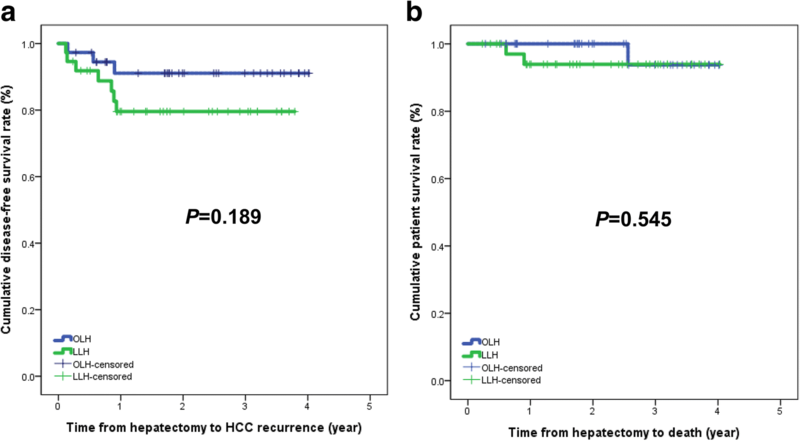 In this study, we aimed to compare the outcomes of purely laparoscopic left hepatectomy (LLH) and open left hepatectomy (OLH) in patients with left HCC. This study included patients who underwent surgical resection of solitary HCC based on preoperative radiological images between December 2012 and October 2016. This study was approved by the Samsung Medical Center Institutional Review Board (SMC-2017-05-090). A total of 139 patients underwent left hepatectomy because of HCC. The diagnosis of HCC was proved based on pathology after hepatectomy. Ruptured HCC cases (n = 5); those with a the history of locoregional therapies such as transarterial embolization (TACE) (n = 11), radiofrequency ablation (RFA) (n = 2), or the combination of TACE and RFA (n = 2); and open conversion cases because of uncontrolled bleeding during laparoscopic procedure (n = 1) were excluded. Two clinically comparable groups of patients were studied: those undergoing laparoscopic left hepatectomy (n = 40) and those undergoing open left hepatectomy (n = 80). The study included hepatectomy from four surgeons. Selection criteria for laparoscopic approach were surgeon dependent. One surgeon did not perform any laparoscopic approach, but three surgeons performed both approaches. Open hepatectomy was performed in cases with previous abdominal surgery or large tumor and in patients who did not agree to undergo LLH because of the expense. Demographic, preoperative laboratory, and pathologic data were prospectively collected in the electrical medical records. None of the patients received postoperative adjuvant therapy before recurrence. The procedures used for surveillance after liver resection have been described previously . All liver resections were intended to be totally laparoscopic and were performed according to the described procedures and the surgeon’s usual practice. The patient was placed in a supine position with the legs apart. Pneumoperitoneum was created by carbon dioxide insufflation at a pressure of 11–12 mmHg, and a 0-degree flexible laparoscope camera was used. When the tumor was located in segment 4, an intraoperative sonographic examination was performed to confirm the exact tumor location and its relationship to major blood vessels. Parenchymal transection was performed with the different types of energy devices (Sonicison, Medtronics or Harmonic Ace, Ethicone or Ligasure, Medtronics) in accordance with the surgeon’s usual practice; devices used were advanced bipolar device, and/or cavitron ultrasonic surgical aspirator (CUSA. EXcel, Valleylab, Boulder, CO). The corresponding Glissonean branch was managed using individual vessel ligation or temporary inflow control of the Glisson (TICGL) method according to the surgeon’s preference . A temporary increase of intra-abdominal pressure of up to 15 mmHg was used to balance the central venous pressure in case of hepatic vein bleeding. Small vessels were controlled with bipolar coagulation and larger vessels were clipped or electively stapled. Pedicle clamping was not used routinely, but only when there was bleeding or when a long operation time was anticipated. The specimen was removed through in a small low-midline incision followed vertical extension of umbilical port trochar site or a Pfannenstiel incision unless there was a previous laparotomy scar, in which case the previous incision was used. Drain catheter was routinely placed at left upper quadrant. Open left hepatectomy was performed through a reverse L-incision. After exploration of the abdominal cavity, the anterior approach was applied to dissect and clamp the left Glissonean pedicle below the hilar plate. When the tumor was located in segment 4, intraoperative sonographic examination was performed to confirm the exact tumor location and its relationship to major blood vessels. Parenchymal transection was achieved using a cavitron ultrasound surgical aspirator (CUSA EXcel; Valleylab, Boulder, CO, USA). Individual vessel ligation of hepatic artery and portal vein before parenchymal transection was performed and intermittent inflow control was done when necessary. Hemostasis was achieved by monopolar electrocoagulation, argon beam, clips, or non-absorbable sutures. Systematic routine placement of an abdominal drain was performed during surgery. Postoperative histological assessment included maximal tumor size, encapsulation, intrahepatic metastasis, multicentric occurrence, microvascular invasion, serosal involvement, and cirrhosis. The histologic grade of HCC was assigned according to the Edmonson-Steiner system as well differentiated (grade I), moderately differentiated (grade II), or poorly differentiated (grade III, IV). All statistical analyses were performed using SAS version 9.4 (SAS Institute Inc., Cary, NC, USA). Continuous variables are described as median with range. Categorical variables are expressed as number and percentage of patients. Fisher’s exact test was conducted to evaluate differences in the frequencies of categorical variables between the groups. Mann-Whitney U analysis was conducted to evaluate differences in continuous variables between the two groups. The Kaplan-Meier survival method was performed to evaluate differences in patient survival between the two groups. Prognostic factors of patient survival were identified by Cox regression analysis. To overcome possible selection bias, 1:1 propensity score matching between the laparoscopic left hepatectomy and open left hepatectomy cohorts was applied using multiple logistic regression and a 1:1 matching requirement via the nearest-neighbor matching method. Statistical matching was executed using R 3.2.1 (Vienna, Austria; http://www.r-prject.org/). We matched patients with regard to tumor size and presence of microvascular invasion. All tests were two-sided, and statistical significance was defined as P < 0.05. The LLH group contained 40 patients, and the OLH group contained 80 patients. All patients underwent curative hepatectomy. Patient baseline and preoperative characteristics of the two groups are summarized in Table 1. Gender, age, etiology, white blood cell count, neutrophil-lymphocyte ratio, hemoglobin level, platelet count, total bilirubin, alkaline phosphatase (ALP), international normalized ratio (INR), albumin, creatinine, C-reactive protein (CRP), alpha-fetoprotein (AFP), and indocyanine green retention rate at 15 min (ICG-R15) were not different between the two groups before and after matching. The median aspartate transaminase (AST) and protein induced by vitamin K absence/antagonism-II (PIVKA-II) were higher in the OLH group than in the LLH group (31 U/L vs. 28 U/L; P = 0.041 and 278.5 mAU/mL vs. 32.5 mAU/mL; P = 0.001), but there were no statistically significant differences between the two groups after matching. There was no difference in alanine transaminase (ALT) level between the two groups before matching, but ALT was higher in the OLH group than in the LLH group after matching. The median operation time in the LLH group was longer than that in the OLH group (266 min vs. 239 min; P = 0.005), but no statistically significant difference was found between the two groups after matching (Table 2). Blood loss was not different between the two groups before and after matching. Two patients (2.5%) in the OLH group and three patients (7.5%) in the LLH group received red blood cells before matching. The median postoperative hospital stay was significantly shorter in the LLH group than in the OLH group before and after matching (9 days vs. 13 days; P < 0.001). The overall complication rate was 10.0% (n = 8) in the OLH group and 7.5% (n = 3) in the LLH group (P = 0.468). Atrial fibrillation (n = 1), ascites (n = 1), increased total bilirubin level (n = 1), nausea (n = 2), pleural effusion (n = 1), and pulmonary artery embolization (n = 1) developed in the OLH group and ascites (n = 1), cardiac enzyme elevation (n = 1), and pleural effusion (n = 1) in the LLH group. However, none of the patients had complications greater than Clavien–Dindo classification III. All complications were controlled with pharmacologic treatment or conservative management. Median tumor size in the OLH group was larger than that in the LLH group (4.2 cm vs. 2.6 cm; P < 0.001). The incidence of microvascular invasion was higher in the OLH group was higher than in the LLH group (81.0% vs. 61.5%; P = 0.027). However, tumor size and microvascular invasion were not different between the two groups after matching. Free resection margin, tumor necrosis, tumor hemorrhage, encapsulation, portal vein tumor thrombosis (PVTT), bile duct tumor thrombosis (BDTT), serosal involvement, intrahepatic metastasis, multicentric occurrence, and cirrhosis were not different between the two groups before and after matching (Table 2). The median follow-up period was 26.0 months (range, 2.5–48.2 months) for the OLH group and 22.8 months (range, 2.8–48.4 months) for the LLH group before matching (P = 0.226). Recurrence of HCC was observed in 13 patients (16.3%) in the OLH group and 8 patients (20.0%) in the LLH group. Initial recurrence sites were liver (n = 12) and synchronous liver and lung (n = 1) in the OLH group. The initial recurrent site in the LLH group was liver in seven patients and peritoneum in one patient. However, no trocar-site deposits were observed in the LLH group. Two patients (2.5%) in the OLH group and two patients (5.0%) in the LLH group died of HCC recurrence. The disease-free survival (DFS) and patient survival (PS) in the LLH group were similar to those in the OLH group before matching (P = 0.570 and P = 0.452, respectively, Fig. 1). The DFS and PS at 3 years were 79.6 and 93.9% in the LLH group and 91.1 and 93.8% in the OLH group, respectively. The DFS in the LLH group was worse than that in the OLH group after matching, but there was no statistically significant difference between the two groups (P = 0.189). The PS in the LLH group was similar to that in the OLH group (P = 0.545; Fig. 2). No risk factors for predicting HCC recurrence were revealed after propensity score matching (Table 3). Laparoscopic approach was not a risk factor of HCC recurrence in univariate and multivariate analysis. Laparoscopic liver resection has become more frequent, and the results of large series have been reported worldwide, confirming the technical feasibility, postoperative benefit, and oncological safety of this technique [4, 5, 7, 13]. A recent study reported that laparoscopic liver resection is safe and feasible in patients with solitary large HCC (diameter 5-10 cm) [16, 17]. Nevertheless, the application of the laparoscopic technique to liver resection for HCC is challenging. Tumor size and location are two important factors determining the indications for laparoscopic liver resection in patients with HCC. We have used the Glissonean approach of left hepatic artery and left portal vein for inflow control in patients with hepatocellular carcinoma . In this study, we focused on only left hepatectomy in patients with solitary HCC because surgical approaches are different depending on tumor location. In addition, the lack of an adequate resection margin can be a problem during non-anatomical hepatectomy when the comparison between laparoscopic and open hepatectomy includes all procedures of hepatectomy. Our study included solitary HCC patients who were diagnosed in the preoperative radiologic images. In our study, intrahepatic metastasis in 12 patients (10%) and multicentric occurrence in 5 patients (4.2%) were reported in the pathology. There was a slight difference between preoperative imaging and pathologic report. Intrahepatic metastasis or multicentric occurrence were not detected in the preoperative images because of small size. The present study found that the duration of operation, blood loss, transfusion rate, and operative complication rates were not significantly different between the laparoscopic and open hepatectomy groups after matching. However, the hospitalization stay was shorter in the LLH group than in the OLH group. The open conversion rate in the patients who underwent laparoscopic hepatectomy was 2.3–4.1% in published studies [18, 19]. The conversion rate for LLH in the present study was 2.4% (n = 1). Previous studies are summarized in Table 4. These studies, which included all hepatectomy procedures, reported that blood loss in laparoscopic hepatectomy was lower than that in open hepatectomy [1, 3, 8]. However, another study reported that only left hepatectomy also showed greater blood loss with the laparoscopic approach compared with the open approach . Adequate pressure in the pneumoperitoneum is advantageous for the reduction of venous bleeding during hepatectomy. However, previous studies revealed that blood loss in the laparoscopic approach was higher than in the open approach if pneumoperitoneum was not made in the operative field. These results might reflect the additional difficulties and complexity of laparoscopic hepatectomy. Most previous studies reported similar transfusion rates between the two groups [1–3, 7, 12, 13, 17, 20]. Our study also showed that transfusion rate was similar in both groups. Two studies that included only left hepatectomy reported that operative time for the laparoscopic approach was significantly longer than that for open hepatectomy . Three matching studies reported similar operative times between the two groups [1, 3, 17], but two studies showed that operative times were significantly longer in the laparoscopic approach than in the open approach despite matching [7, 12]. All previous studies reported a shorter hospital stay with the laparoscopic approach than the open approach [1–3, 7, 13, 17, 20]. The mortality and morbidity rates of patients who underwent laparoscopic left hepatectomy were 0 and 7.5%, respectively. Our results are better than those of several other reports [1–3, 13]. The present study did not reveal a significant difference in complication rate between the groups because the rate of complications in both groups was very small. Although the difference was not statistically significant, the rate of postoperative complications tended to be higher in the open left hepatectomy group (10.0%) compared with that in the laparoscopic left hepatectomy group (7.5%) (P = 0.468). Bile leakage did not develop in any of our cases. With meticulous dissection, good surgical outcomes could be expected. Even after matching, we found that the complications rates of laparoscopic left hepatectomy were comparable to those of open left hepatectomy. Despite an exponential growth in cases of laparoscopic liver resection, the outcomes in HCC patients are yet to be fully elucidated. To overcome selection bias as much as possible, propensity score matching was employed in this study. The propensity score model reduces the different distribution of covariates among individuals allocated to specific intervention . Although a randomized controlled trial can provide the most unbiased evidence for clinical science, it is unfeasible to recruit patients and obtain consent when the patients have to choose between surgical procedures with obvious differences. A propensity score model is closest to the actual clinical situation and decreases the variance of an estimated exposure effect without increasing the bias. In the present study, tumor size was larger and presence of microvascular invasion was higher in the OLH group that in the LLH group before matching. Large tumor size as a contraindication to laparoscopic hepatectomy remains controversial. Therefore, we performed propensity score matching using these two variables to compare the oncological outcomes between LLH and OLH. We showed that DFS was lower in the LLH than in the OLH group after matching, but there were no statistically significant differences in DFS and PS between LLH and OLH. Previous studies reported that DFS and PS in laparoscopic approaches were comparable to those in open approaches (Table 5) [1, 3, 7, 13, 17]. Our study also revealed the similar outcomes between LLH and OLH. The present study has limitations that include the relatively small sample size, short follow-up duration, and retrospective design. 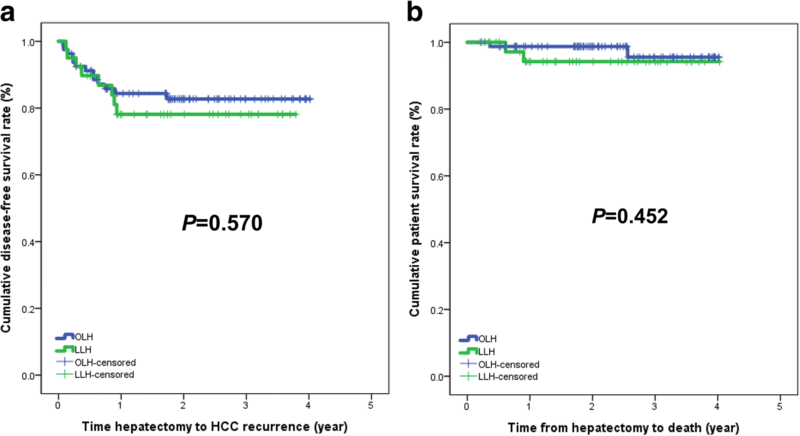 However, our study has the strength of including only left hepatectomy in HCC patients, thus excluding the selection bias of various surgical hepatectomy procedures. Present study confirmed the recognized advantage of LLH regarding reduced hospitalization and showed a similar complication rate to OLH. Although the LLH group appears to have a lower DFS than the OLH group, there is no statistical difference in the oncological outcome between the two groups. The present study reveals that pure LLH is safe and feasible in selected patients with solitary and small HCC. The datasets generated and/or analyzed during the current study are not publicly available because the hospital was not allowed to take the datasets out but are available from the corresponding author on reasonable request. JMK design, literature search, data acquisition, analysis, interpretation, and writing, CHDK and JWJ: design and data interpretation, HY and KK: data analysis, KSK, JL, and GSC: acquisition and analysis of data. All authors read and approved the final manuscript. This study was approved by the Samsung Medical Center Institutional Review Board (IRB) (SMC-2017-05-090). The consent of the participant was exempted through IRB.